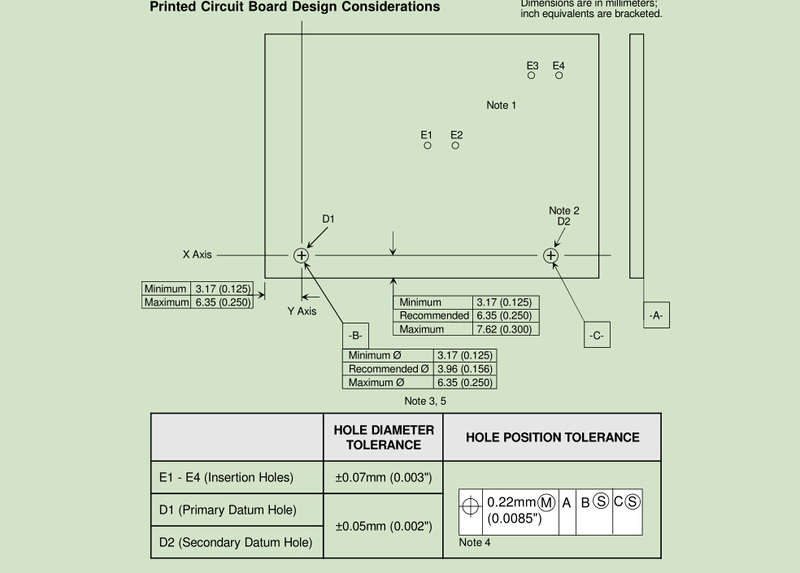 The purpose of this document is to improve printed circuit board design and layout by detailing the basic considerations associated with the electronic assembly process. 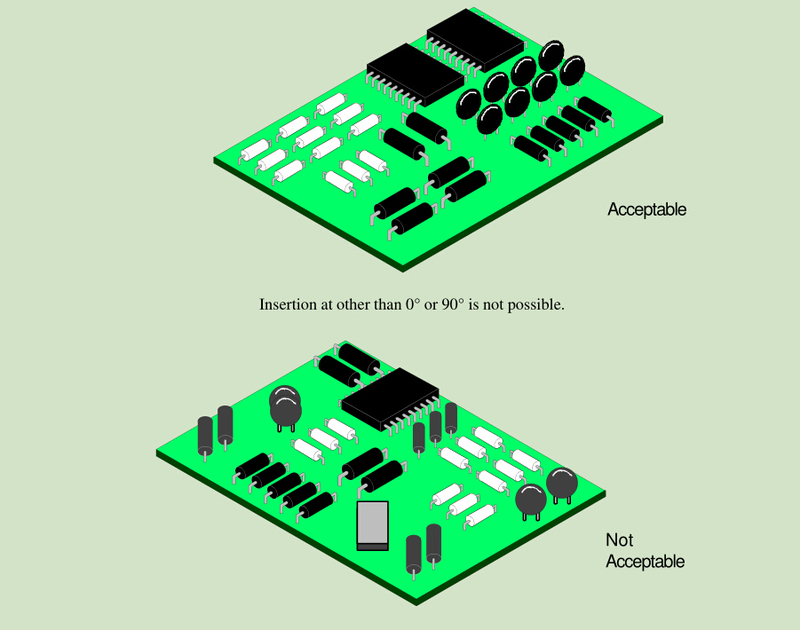 Southern Machinery’s experience has shown that applying these design principles produces efficient, reliable board designs. Automatic component insertion provides the consistency required to ensure the highest levels of circuit board quality, throughput, and process control. When properly planned and implemented, automatic component insertion provides significant cost savings in the printed circuit board assembly process. The benefits realized from automating circuit board assembly processes span all areas of manufacturing. Ultimately, all of these benefits result in improved products and reduced production costs. Southern Machinery’s automated assembly equipment provides reliable automatic component insertion utilizing standard printed circuit board materials. These materials include, but are not limited to, glass epoxy, paper epoxy, and paper phenolic. As long as the select materials meet the size, shape, form, and positional accuracy described in this document, reliable component insertion will be achieved. Maximum board size is generally related to the insert-able area of the insertion machine. For machines operating in a stand-alone configuration, board shape (rectangle and square, for example) is not a major concern as these boards are typically placed on a dedicated work-board holder. Machines using automatic board handling require special consideration to size, shape, warp-age, and cutouts. Throughput may be increased by positioning small boards into multiple breakaway panels/arrays. Standardization of panel size will reduce setup time during job changeover. Warp-age should be minimized. Board warp-age may cause board transfer errors and reduce insertion performance. 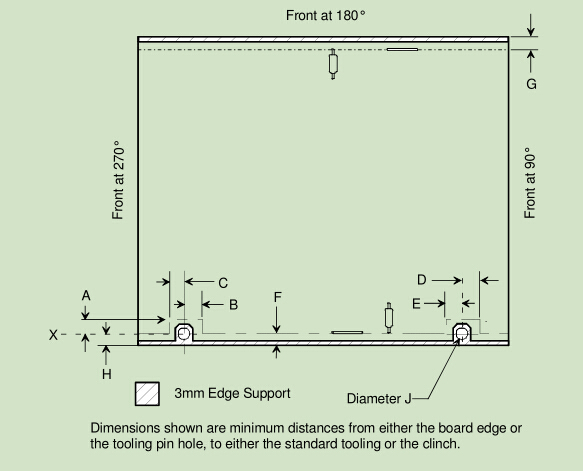 Of prime importance in board design and construction is the establishment of accurate datum points. Datum holes provide the locating references to which all holes are drilled or punched. These references are also used to accurately position the board on the work-board holder and reduce printed circuit board tolerance accumulation. Southern Machinery insertion machines are capable of inserting components at 0° and 90°. For maximum throughput on DIP and axial inserters, components should be inserted in one axis only. Radial machines can insert components at 0° or 90° without affecting throughput. Two axes insertion, as shown below, is an acceptable and efficient way of inserting components. The work-board holder allows one or more printed circuit boards to be secured to the positioning system for component insertion. Work-board holders that do not provide accurate and reliable board location will reduce insertion performance. 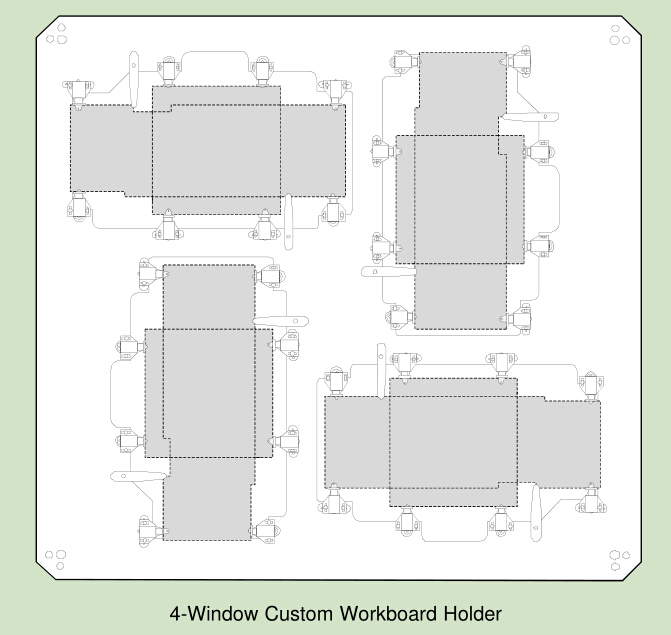 Custom work-board holders are designed to accommodate specific printed circuit board sizes. 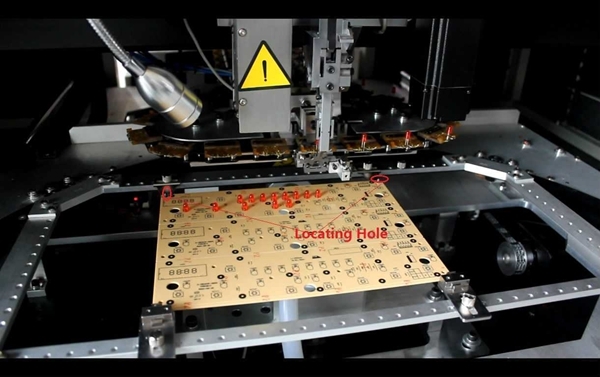 Multiple printed circuit boards may use the same custom work-board holder if board sizes and locating holes are standardized. A production environment where large lot sizes, medium-to-high product changeovers, and maximum through-puts are required is ideal for custom work-board holders. 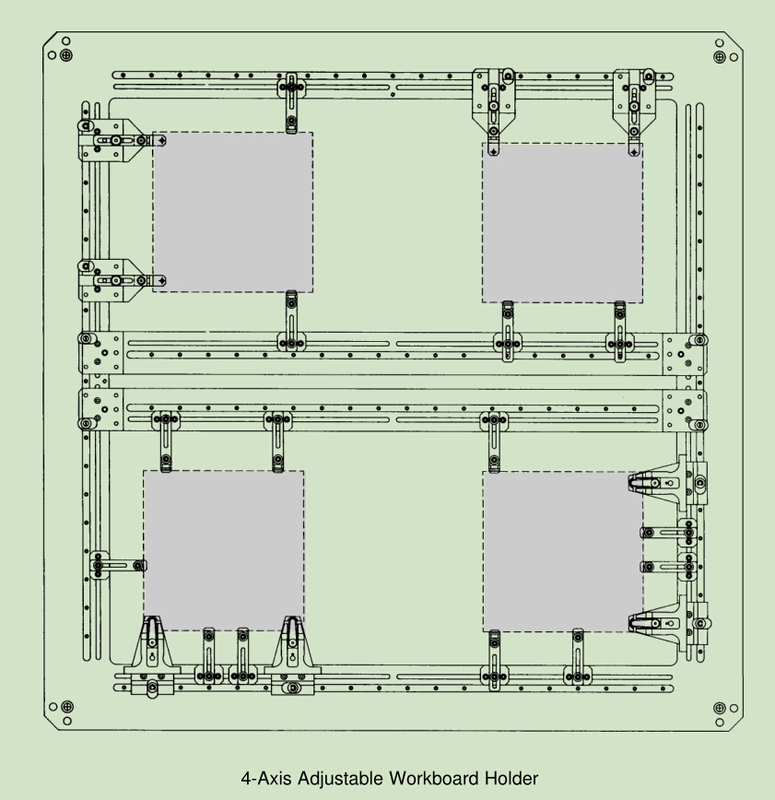 Adjustable workboard holders are designed to accommodate production environments that consist of multiple printed circuit board sizes (prototypes and contract manufacturers) with low-to-medium job changeover. Automatic board handling allows continuous machine operation by loading and unloading PC boards without operator intervention. The best applications are high volume, with low-to-medium job changeover. 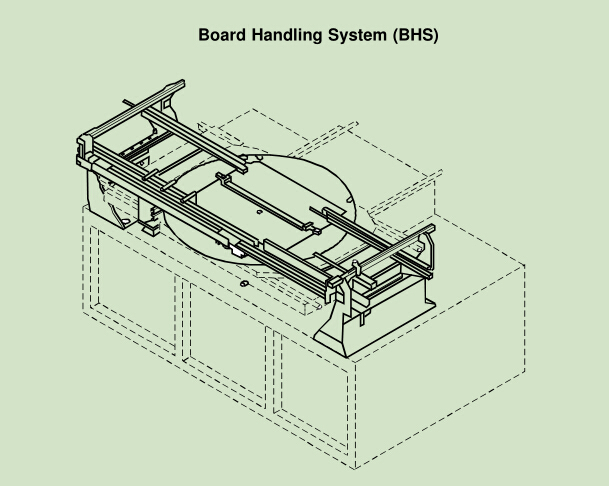 BHS (Board Handling System) for L-to-R or R-to-L board transfer, which is available on single or dual head machines. SBT (Single Board Transfer) is available for same side in/out applications, for single head machines only. This section has been prepared to assist in the design of boards for use with the Southern machinery axial lead component insertion machines. Included in this group of machines are Southern Machinery’s line of axial sequencers and axial and jumper wire inserters. 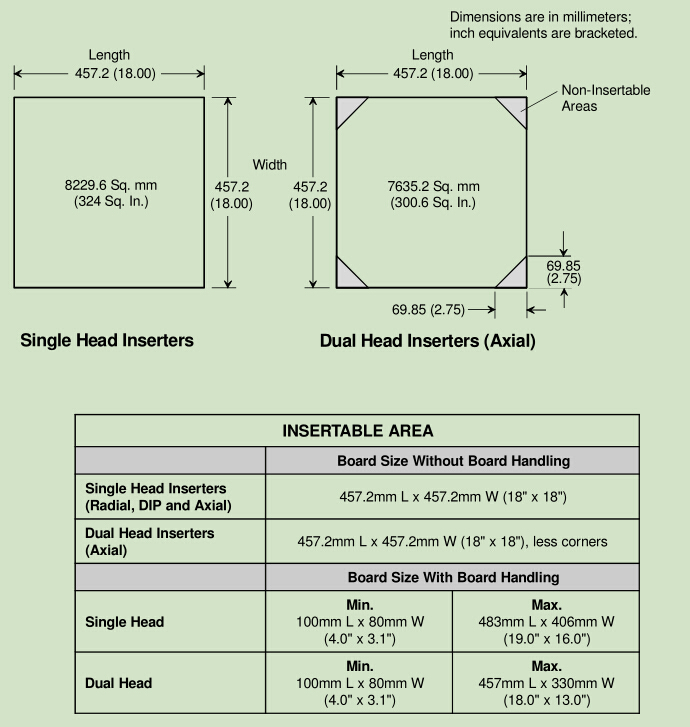 In addition to the inserters, information pertaining to the Stand Alone Sequencer product line (2596 series) is included.These design guidelines are intended to provide optimum component insertion reliability when processing axial components on Southern Machinery equipment.It is important to understand that there is optional tooling available for Southern Machinery axial insertion equipment that should be considered when designing clearances around components. This section is written to assist in the design of boards for use on Southern Machinery’s radial insertion equipment.This group of machines includes radial sequencer/inserters.Southern Machinery’s radial sequencer/inserters are designed to automatically insert randomly sequenced radial leaded devices with two and three taped leads. Some components, such as SIPs, may have up to 10 leads. Components prepped and taped in a radial leaded configuration, which conform to the specifications described in the Input Specifications on the following pages, can be processed by Southern Machinery’s radial sequencer/inserters. 1. Dimensions are to centerline of lead. 2. Dimensions are to the bottom of the ‘V’ groove in the former.